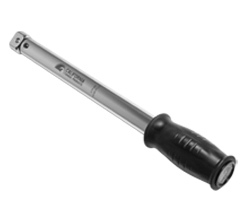 CTP-200iIRH preset interchangeable click type torque wrench is an industrial grade interchangeable head wrench designed for years of service. The wrench is equipped with a 9x12 mm quick release receiver and can be preset anywhere from 40-200 In-Lbs. The wrench is equipped with an over molded, chemical resistant and ergonomic comfort grip rubber handle. The tube is highly polished bright chrome finish with a laser etched serial number. The accuracy and repeatable measurements are +/-3% from 20 up to 100% of the range. The wrench is fully repairable and easily calibrated. There are a variety of Metric and SAE sizes of open end, ring and ratchet adapters that can be used with this torque tool. The wrench is supplied with a plastic blow molded case with individual slots for 7 different adapters. It is calibrated to +/-3%, and a Certificate of Conformance is provided with each wrench. 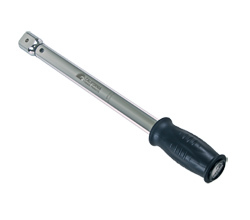 The wrench meets and/or exceeds all ASME B107.14M-1994 & ISO 6789: 2003 standards. CTP-80IRH preset interchangeable click type torque wrench is an industrial grade interchangeable head wrench designed for years of service. 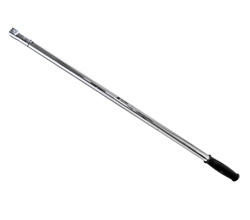 The wrench is equipped with a 9x12 mm quick release receiver and can be preset anywhere from 10-80 Ft-Lbs. The wrench is equipped with an over molded, chemical resistant and ergonomic comfort grip rubber handle. The tube is highly polished bright chrome finish with a laser etched serial number. The accuracy and repeatable measurements are +/-3% from 20 up to 100% of the range. The wrench is fully repairable and easily calibrated. There are a variety of Metric and SAE sizes of open end, ring and ratchet adapters that can be used with this torque tool. The wrench is supplied with a plastic blow molded. It is calibrated to +/-3%, and a Certificate of Conformance is provided with each wrench. The wrench meets and/or exceeds all ASME B107.14M-1994 & ISO 6789: 2003 standards. 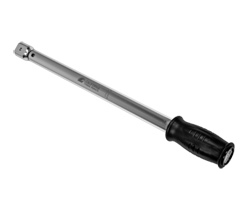 CTP-150IRH preset interchangeable click type torque wrench is an industrial grade interchangeable head wrench designed for years of service. The wrench is equipped with a 14x18 mm quick release receiver and can be preset anywhere from 20-150 Ft-Lbs. The wrench is equipped with an over molded, chemical resistant and ergonomic comfort grip rubber handle. The tube is highly polished bright chrome finish with a laser etched serial number. The accuracy and repeatable measurements are +/-3% from 20 up to 100% of the range. The wrench is fully repairable and easily calibrated. There are a variety of Metric and SAE sizes of open end, ring and ratchet adapters that can be used with this torque tool. The wrench is supplied with a plastic blow molded case with individual slots for 10 different adapters. It is calibrated to +/-3%, and a Certificate of Conformance is provided with each wrench. The wrench meets and/or exceeds all ASME B107.14M-1994 & ISO 6789: 2003 standards. CTP-250IRH preset interchangeable click type torque wrench is an industrial grade interchangeable head wrench designed for years of service. The wrench is equipped with a 14x18 mm quick release receiver and can be preset anywhere from 30-250 Ft-Lbs. The wrench is equipped with an over molded, chemical resistant and ergonomic comfort grip rubber handle. The tube is highly polished bright chrome finish with a laser etched serial number. The accuracy and repeatable measurements are +/-3% from 20 up to 100% of the range. The wrench is fully repairable and easily calibrated. There are a variety of Metric and SAE sizes of open end, ring and ratchet adapters that can be used with this torque tool. The wrench is supplied with a plastic blow molded case with individual slots for 7 different adapters. It is calibrated to +/-3%, and a Certificate of Conformance is provided with each wrench. The wrench meets and/or exceeds all ASME B107.14M-1994 & ISO 6789: 2003 standards. 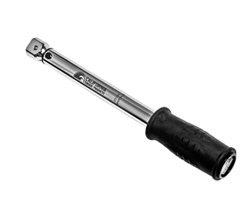 CTP-600IRH preset interchangeable click type torque wrench is an industrial grade interchangeable head wrench designed for years of service. The wrench is equipped with a 14x18 mm quick release receiver and can be preset anywhere from 100-600 Ft-Lbs. The wrench is equipped with an over molded, chemical resistant and ergonomic comfort grip rubber handle. The tube is highly polished bright chrome finish with a laser etched serial number. The accuracy and repeatable measurements are +/-3% from 20 up to 100% of the range. The wrench is fully repairable and easily calibrated. There are a variety of Metric and SAE sizes of open end, ring and ratchet adapters that can be used with this torque tool. The wrench is supplied with a plastic blow molded. It is calibrated to +/-3%, and a Certificate of Conformance is provided with each wrench. The wrench meets and/or exceeds all ASME B107.14M-1994 & ISO 6789: 2003 standards.